What’s your favorite tomato? All true tomato lovers and growers have a few tomato varieties that they just couldn’t imagine not growing and always recommend to their friends and fellow gardeners. One popular heirloom variety that continues to be a favorite among many and consistently wins taste tests across the country is the Cherokee Purple tomato. Cherokee purple tomato is a beefsteak style tomato whose skin is a dusky rose- red color. When sliced its interior is an even darker red. The flavor is described as a “balance of sweet, acid and savory with a hint of smoke.” Cherokee Purple is best eaten fresh on sandwiches or in salads. With a name like “Cherokee Purple,” there has to be a story there somewhere. Craig LeHoullier, an heirloom tomato grower, connoisseur and author of the book Epic Tomatoes is who we can thank for bringing this delicious tomato to the masses. In 1990, Craig received a package from John D. Green of Sevierville, Tennessee containing seeds of an unnamed purple tomato. John explained that his neighbor had shared the seeds with him and that her family had been passing along the seeds since the late 1800s when they were originally received from Cherokee Native Americans. Craig grew the seeds in his 1991 garden and gave this beauty the name Cherokee Purple. Next, Craig passed the seeds on to the folks at Southern Exposure Seed Exchange. They loved the taste of this tomato and first listed the seed in their catalog in 1993 and its popularity has continued to grow since. Want to try this delicious variety in your garden this year? Grab some Cherokee Purple seeds today! https://www.bbbseed.com/wp-content/uploads/2019/01/BBB-Seed-logo-with-tagline.png 0 0 Becky Hansen https://www.bbbseed.com/wp-content/uploads/2019/01/BBB-Seed-logo-with-tagline.png Becky Hansen2019-04-12 05:00:462019-04-08 17:00:49What is your favorite tomato? With a name like “Cherokee Purple” there has to be a story there somewhere. Craig LeHoullier, an heirloom tomato grower, connoisseur and author of the book Epic Tomatoes is who we can thank for bringing this delicious tomato to the masses. In 1990, Craig received a package from John D. Green of Sevierville, Tennessee containing seeds of an unnamed purple tomato. John explained that his neighbor had shared the seeds with him and that her family had been passing along the seeds since the late 1800’s when they were originally received from Cherokee Native Americans. Craig grew the seeds in his 1991 garden and gave this beauty the name Cherokee Purple. Next, Craig passed the seeds on to the folks at Southern Exposure Seed Exchange. They loved the taste of this tomato and first listed the seed in their catalog in 1993 and its popularity has continued to grow since. Already the bounty of vegetables and herbs from the summer garden are becoming a distant memory. It’s time to dig into the freezer and start to use up some of those precious flavors in the cold winter months. Let’s start with the delicious pesto(s) you made and froze back in June [Pesto Secrets] which is so useful in so many more ways than pasta. Pesto pairs particularly well with such winter delights as frozen roasted or sundried cherry tomatoes [Summer Harvest] and creamy mozzarella or burrata cheese so think of ways to include those items in some of the ideas listed below. But let’s look at some special spins on pesto. Let us know if you have other uses beyond pasta for the delicious pesto you made and froze this summer! Summer is starting to wind down and perhaps you want to do something with all of those green tomatoes. Here are two interesting and delicious recipes for you to try. Green tomatoes are high in Vitamins A & C, full of potassium and a good source of fiber. Put tomatoes in a large bowl and cover with boiling water. Let steep until peels can be easily removed then chop roughly. Place all ingredients in a non-reactive pot and bring to a boil. Reduce heat and simmer until the chutney is thick, stirring occasionally. Can be refrigerated or water bath canned. Place the tomatoes, lemon juice and sugar in a bowl and let macerate overnight. The next day, pour the mixture into a non-reactive pot along with the zest. Stir over low heat until sugar has dissolved, then turn up the heat and bring to a rapid boil for one minute. Add ginger, stir well and skim if necessary. The ways in which to support tomatoes are as varied as the gardeners who grow them. Staking your tomatoes is important for many reasons. Keeping your plants upright and off the ground helps keep not only insects and critters at bay but can prevent many tomato diseases as well. Click here to check out our comprehensive guide to tomato diseases. Staking maximizes growing space, makes harvesting easier and keeps the garden looking tidy. Here is a little information about three different methods you can use to successfully stake your tomatoes. Caging tomatoes is an easy and efficient way for the home gardener to support tomatoes. Store bought cages come in a wide variety of sizes and colors. The smaller cages are more appropriate for determinate tomato varieties which are more compact in size averaging around 3-4’ tall. The larger cages will best suit the large, sprawling indeterminate varieties which can range in height from 6-12’. You can make your own tomato cages too. Hardware stores sell rolls of wire fencing or mesh that when cut in 5’x5’sections can be rolled into a circular cage and placed over the plant. This is best done while the plants are still small. Pin the ends together with wire or zip ties and anchor the cage into the ground with stakes. Make sure your grid openings are at least four inches in diameter. This will make pruning and harvesting a breeze. These cages are sturdy and will last for years. Staking tomatoes is also an effective way to support your tomatoes. This method simply requires driving a stake into the ground near the plant and tying the plant up the stake as it continues to grow. To avoid any root damage, place stakes in the ground before planting or when plants are still young. For indeterminate tomato varieties, stakes should be at least 7 feet tall and driven a good foot into the ground. This will keep the stake from tumbling over with the weight of the plant. Stakes can be wood, plastic, metal or made from salvaged materials. When tying up your tomatoes, it is best done loosely and with a soft material. I like to use old t-shirts cut into strips. In the Florida or basket weave technique you are essentially sandwiching your tomato plants between two walls of twine. This technique works best when you are planting in rows. Begin by placing one stake at the end of each row, or space stakes every 3- 4’ apart for longer rows. Drive stakes into the ground at least one foot deep. Next, tie your twine to your end stake about 8-10” from the ground. Pull the twine past one side of your tomatoes to the front of the next stake. Loop the twine around the back of the stake and pull tight. Keeping the string taught continue down the row until you reach your last stake. Tie off at the last stake. Now, loop back the other direction until you are back where you started. Tie the twine to the first stake. 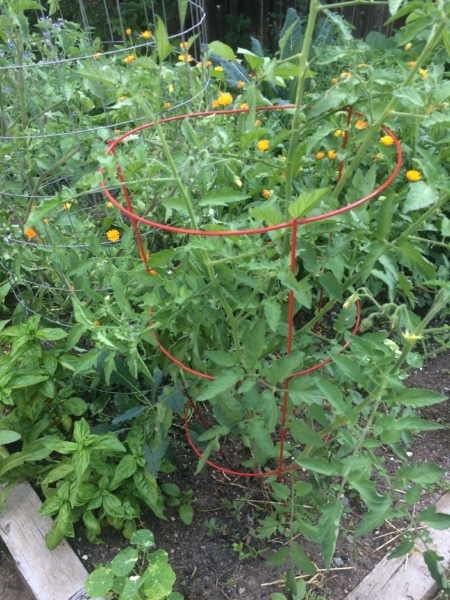 As your tomatoes grow you will need to add another layer of twine about every 6-8” to keep the plants upright. Check out this video demonstrating the Florida or basket weave technique. Nothing is better in mid to late summer than the taste of a garden-fresh tomato. However, it takes a lot of hard work and care to help your tomatoes survive their perilous journey from seed to fruit. Here are nine common tomato diseases and what you need to do to treat them. Many common tomato diseases are caused by fungi. These diseases often are caused by specific environmental conditions like high moisture and certain temperature ranges. They are most often spread by contaminated soil or water and are usually manageable with vigilant prevention techniques and various fungicides. Anthracnose (Colletotrichum coccodes) is a fungal disease that primarily attacks the tomato fruits. It will affect both green and ripe tomatoes and will appear as small, sunken water-soaked area on the outside of the tomato. As the disease progresses, the spot will widen and turn dark and expand. Infected unripe tomatoes will not show symptoms until the fruit ripens and the disease progresses faster the closer the tomato is to maturity. Another fungal disease, Septoria Leaf Spot is caused by Septoria lycopersici. Unlike Anthracnose, Septoria attacks the leaves and stems of the plant but does not affect the fruit. The disease is more likely to appear on leaves closer to the ground and appears as the plant begins to fruit. The primary symptoms are numerous round and small spots on the leaves that are dark on the outside and lighter in the center where the spore-producing bodies are. Highly infected leaves will yellow and fall off, which can expose the tomato fruit to the sun and cause sunscald. Caused by the fungus Alternaria solani, Early blight affects older leaves and appears as a small brown spot with concentric rings. As it spreads throughout the leaf, it will cause it to yellow and wither. This can weaken the plant and expose the tomato fruit to sunscald and reduce yield. The fungus can also attack the stem and fruit but is less common than in the leaves. It often progresses upward from the bottom of the plant. Late Blight (Phytophthora infestans) is a disease found in tomatoes and potatoes and is most infamous for causing the Irish Potato Famine. Late blight thrives in humid, cool weather ( >90% humidity and <80°). It appears on all parts of the plant, usually starting on older leaves and then spreading to fruit and stems. It appears as a dark, water-soaked patch that will soon enlarge and grow a white moldy substance. Late Blight is a slightly different beast than the other fungal diseases. It can move quickly through the garden and is spread by both water and wind. You can do all the prevention in the world, but a nearby garden with infected plants can blow spores over into your yard! Use the treatment prescribed bellow but be prepared to pull and destroy plants if it spreads too far to save to rest of your garden and your neighbors’ gardens as well. Fusarium Wilt (Fusarium oxysporum) is a warm-weather disease most common in southern regions. It appears as a wilting or drooping of the lower leaves, followed by the wilting and death of the entire plant. Oftentimes, leaves on one side of the plant will turn yellow. The disease attacks the roots through the infected soil and will clog off the vascular system of the plant. It usually hits younger plants and there is no known treatment. The best way to prevent wilt to ensure that any soil or material you place in your bed is clean, including the soil from starts. There are also some disease-resistant hybrids. Our blog on keeping tomatoes in hot weather will help you tell if your plants are sick or just thirsty! Fungi thrive in warm wet environments. The spores are transmitted primarily from splashing water, either from rain or irrigation. Poorly drained soil, overwatering, and lack of air circulation around the plant can all create conditions for the spread. If your seeds are healthy, you can save them for future use. Here is our blog on the subject. If you do see Anthracnose in your tomatoes, make sure to harvest the fruits as soon as they are ripe. Copper-based fungicides and a few organic fungicides can be effective for treatment of infective plants. If you see infected leaves, feel free to remove them to help slow the spread of the disease. Make sure to wash your hands and tools after handling infected plant material. After seeing any fungal diseases in your garden (besides Late Blight, which does not overwinter), make sure rotate your planting sites on a three-year cycle with plants that are not from the Solanaceae family (i.e. tomatoes, eggplants, peppers), which are closely related to tomatoes. Make sure to remove all plant material at the end of the season and do your best to keep the site weed free. If you do not have another planting site to rotate with, switch to containers instead. Unlike funguses, which are multicellular organisms with complex cells (eukaryotes), bacteria are simple, single-celled organisms (prokaryotes). Bacteria are the most common form of life on earth and are, for the most part, harmless. However, there are some bacteria that specialize in infecting and living in other species. These can be harmless, like the natural bacteria in your gut that helps you digest things like cellulose, but are sometimes dangerous, or pathogenic. Just like you can get strep throat from bacteria, your tomatoes are susceptible to them as well. While mostly seen in greenhouse conditions, Tomato Pith Necrosis can occur during the early growing season in periods with cool temperatures and high humidity. Plants are especially susceptible in areas with high nitrogen levels, when the tomato starts are growing rapidly. The first noticeable symptoms of this disease are usually wilted leaves followed by black lesions on the stems. As the disease progresses and the bacteria become more established in the stems, splits, cracks, shrinking, and other deformations are common. If there are green fruit, the disease can cause a greasy, water-soaked spot on the blossom end of the fruit. The best prevention of Tomato Pith Necrosis is to have control over your soil conditions. The main factor in pith necrosis is excess nitrogen in the soil. Don’t over fertilize early in the season and keep tabs on your soil quality. Also, like with the fungal diseases, make sure your plants are properly spaced so they have room to breathe and dry out and avoid overhead watering. If your plants do become infected, you can wait until warmer, dryer weather to see if they recover. If not, remove and dispose of them. Make sure that you are rotating your plots on a three-year cycle and do not plant in plots that have had closely related plants like peppers. Do not put them in your compost because the bacteria can live on the diseased plant material for years. Bacterial spot attacks the leaves and fruit of the tomato plant. It occurs during wet and warm conditions and can cause leave wilting, leaf and fruit spots, and defoliation. The leaves will show small and irregular spots as well as yellowing and browning as the disease persists. The fruit will have multiple dark specs that are dry and rough to the touch. Fruit inflicted with Bacterial Spot, as with any diseased fruit, should not be consumed. While the disease itself isn’t dangerous to humans, it provides openings for dangerous pathogens to enter the fruit. Spot often appears after heavy summer rainstorms. Make sure your plants are well spaced and pruned so they can air out effectively. Do not use overhead watering. If you are in an area where Spot has been seen, make sure you are cleaning your tools and rotating your plants. Preventative applications of copper-based fungicide can be effective in controlling spot. If your plant does have Bacterial Spot, make sure that you immediately remove and dispose of it. Clean any tools you use with a 10% bleach solution or rubbing alcohol. Remove any plant debris. Bacterial Canker is one of the most difficult to identify and control tomato diseases once it takes hold. It can affect plants of all ages and has a variety of symptoms that are easily confused with other diseases. Early symptoms are spots, browning, and wilting of leaves. Later symptoms include raised spots on the stems and fruit, which often include a white “halo” around a brown spot in the center. On older plants. The stems will show cankers or open “sores”. Once this disease takes hold, the plant is essentially doomed. Prevention is the best defense against bacterial canker. Buy only certified disease-free seeds. Avoid overhead watering and space plants appropriately. Copper-based fungicides can be effective in prevention. If you notice this disease on your plant, make sure to remove it, any plant debris and its neighboring plants immediately. Bag the removed plant material and dispose of it. Clean your tools and do not plant tomatoes on the site for a few years as the disease can live in the soil. Viruses are pathogens that are usually a piece of genetic material surrounded by a protein. Not technically alive, these diseases are usually spread by “vectors” or living things that carry the disease. Think mosquitoes carrying West Nile. Since each virus is spread differently, each will need its own prevention plan. There is no treatment for viral infections and the best course of action is often to remove and destroy infected plant material. Mosaic Virus is a family of viruses that can affect tomatoes, peppers, and other plants in your garden. The most common one that might impact your tomatoes is the Tobacco Mosaic Virus (TMV), the Tomato Mosaic Virus (ToMV), and the Cucumber Mosaic Virus (CMV). Despite their names, all of these can seriously infect your plants. The symptoms of both TMV and ToMV are varied and difficult to tell apart. The most common symptoms include irregular growth, strange leaf shapes, and mottled coloring in the leaves and fruit. You may still get yield from tomato plants infected with Mosaic Virus, but it will likely be stunted and fewer than you would have gotten normally. CMV is spread by aphids and create a stunted, bushy, sometimes yellow plant with severe leaf malformation and mottling. Tomatoes with CMV produce very few fruits. TMV and ToMV can be easily spread through touch and soil. Even handling tobacco products like cigarettes can contaminate your garden with TMV. Monitor seedlings closely for signs of the disease and make sure to remove any possibly infected plants. If you are concerned at all, you can make a solution out of skim milk to spray the plants with. Proteins in the milk bind to the virus and make it unable to attack the plant. If you know you have handled any plants, wash your hands and tools with the same milk solution or soap and water to prevent transmission. The virus can live for over two years on surfaces and in the soil, so do not replant in soil that has been infected and make sure to remove all plant material from the site. Since CMV is spread through aphids, the best prevention is to control the weeds in your garden to prevent aphids from jumping from plant to plant. Insecticides are not effective because new aphids can easily pick up the virus and spread it seconds from coming in contact with the plant. Surrounding the tomatoes with taller plants that are not attractive to the aphids can create a buffer and using aphid predators, like ladybugs, can keep the general population of aphids in check. Tomato Spotted Wilt Virus (TSWV) is a highly contagious pathogen that can infect over 1000 different species of weeds, native plants, and ornamentals. It is transmitted through an insect pest known as thrips, which will feed on a variety of different plants. The symptoms of TSWV vary from one variety of tomato to another, but often result in stunting and dead (or necrotic) spots on the leaves. They can also cause low plant yield, mottled fruit, and wilt. Unless your garden is contained within a greenhouse, it will be difficult to control the spread of TSWV. The most effective management is to eliminate the weeds in your garden that can harbor thrips throughout the winter. Remove any remaining plant material and weeds, then till and mulch the garden for winter to remove any habitat for the thrips. If you have plants that are infected with TSWV, you can remove it to prevent it from spreading the disease to nearby plants. Insecticides are relatively ineffective against thrips because applied insecticides are unlikely to come in contact with thrips on the plant and systematic pesticides are not fast enough to stop the thrip from infecting the plant. Insect predators like ladybugs, minute pirate bugs, and lacewings will all feed on thrips. Tomato Yellow Leaf Curl Virus (TYLCV) is a virus that is spread through seeds and whiteflies that causes yellowing and curling of leaves, stunting, flower drop, and severely reduced yield in tomatoes and peppers. While TYLCV can be spread between seeds, the primary risk factor for your garden would be the spread of the virus through whitefly pests. Whiteflies are small, white flying insects that feed on the undersides of leaves. Like TSWV, the best prevention is to keep whiteflies off of your plants. Do your best to keep weeds under control to limit available habitat for the whiteflies, till and mulch during the winter, and introduce natural predators. Products that use canola oil or horticultural oil can act as a whitefly repellent. For how to make your own, check out this article. Another option you may want to consider is to use reflective mulches. These mulches reflect light back up at the plant and disorient insect pests. If your plants do become infected with TYLCV you really only have two options. You can wait it out to see if you do get any harvest, and then remove all susceptible plants at the end of the season. The other option is to remove infected plants immediately to try to limit the spread of the virus. When you do remove your plants, bag them as soon as you can to contain the whiteflies on the plant that are carriers for the virus. Are your tomatoes healthy and beautiful? Read this guide on how to tell when they are ready to pick! Ratatouille screams to me of summer and there are dozens of ways to make it. The only real essentials are tomatoes, onion, eggplant and zucchini cooked down into a stew and seasoned with salt and pepper. It is delicious as a vegetarian main dish and can be served hot, room temperature, or even cold. You can also top it with cheese, add chunks of chicken and serve it over rice, or roll it up in a lettuce leaves or a tortilla. It can be cooked in a crockpot, baked or stewed. Here is a “classic” preparation followed by a few variations for you to play with. You can learn more about the history of this dish here. In a 4-5 Quart pot, heat olive oil and add garlic, eggplant, peppers and onions. Cook over medium heat, stirring often until onions are crisp-tender (about 5 minutes). Stir in zucchini, tomatoes, parsley and basil. Heat to boiling, then reduce to medium, cover and cook for 15 minutes. Remove cover, season with salt and pepper and stir in tomato paste. Continue cooking, uncovered, for another 10 minutes. Serve as is or over hot cooked rice. Top with a sprinkling of cheese. Change up the vegetables in the classic recipe or just add more. Some favorites are corn, peas and beans, or other summer squash such as patty pan. Make it Italian: Melt a couple of anchovies into the oil along with the garlic and tomatoes. This adds a layer of umami flavors that is quite good. Then add a sprinkle of toasted pine nuts and a drizzle of balsamic vinegar just before serving. Consider serving it with a different grain besides rice. Quinoa, farro, couscous and others are a delicious and very healthy twist. At last, the bounty of your summer garden is at its peak and you can gather all of those glorious tomatoes, peppers, eggplants, corn, chard, kale, summer squash, onions and other vegetables to enjoy at their freshest and most flavorful. But, ahem, some of us may plant more than we can eat in a day. Well, whether that is planned excess or not, here are a few tricks for preserving that bounty using just your freezer and pantry. Corn – Shuck as much as you can and then flash boil for about 2 minutes. Let cool and then scrape off the kernels into a large bowl and scoop out two cups into a plastic bag or container for freezing. Add them to that turkey soup you make after Thanksgiving every year along with some of the frozen shell peas you harvested and froze in the spring. Tomatoes – This technique works best with cherry tomatoes and is a little bit of trouble but OMG are these delicious. Add them to pizza, pasta, soups, sandwiches or serve on grilled bread as a quick crostini. The flavor of these will make you want to plant even more tomatoes next year. Heat oven to 200 degrees. Arrange cherry tomatoes on a lined, rimmed baking sheet, cut side up. Drizzle with olive oil and add a sprinkle of salt and pepper. Let them “oven dry” for up to 2 ½ hours, checking frequently at the two-hour mark. You can also do this with large tomatoes which will yield a “saucier” result. Zucchini – Use small, tender skinned, deep green ones. Shred and steam for 1-2 minutes. Freeze in desired quantities for adding to slaw, pasta, soups or your famous zucchini bread. This quick and easy take on the classic Caprese salad makes excellent use of the fresh tomatoes from your garden. It’s especially pretty when you use a variety of colored, heirloom, beefsteak tomatoes such as Cherokee Purple, Aunt Ruby’s German Green and Yellow Brandywine. Whisk together the honey, vinegar, Dijon and olive oil. Arrange tomatoes on a platter, drizzle with dressing and top with cheese and herbs. Sprinkle with a bit of salt and pepper. Powdery mildew had a grand time in my garden this year. I often have a nonchalant attitude to it growing on a few leaves and don’t mind a little bit. But it started early this year on roses, then showed up on the bee balms and finished out the season inundating the sweet peas and squashes. By the time I paid attention, it was out of control. But now it’s Fall and my inner lazy gardener says…ah well this season is over. Next year it will be different. But if we want to make progress against disease in our gardens, now is the time to act. As your squash and cucumbers and pea plants are dying back, remove those leaves and put them in the trash. Not in the compost pile. Don’t let them overwinter and deal with it in the Spring. Fungus and disease spores are sitting passively on the backs of those leaves, just waiting for rebirth next Spring. They do not reliably die in home compost piles. Powdery mildew will survive the winter by forming minute fruiting bodies called cleistothecia And tomatoes? I put the whole plants in the trash after frost. There are just too many diseases on them to risk. In the perennial beds, leaves infected with powdery mildew like rose or phlox or bee balm often drop before Fall. Before the big tree leaf fall, I use the blower to blow the diseased leaves out of the bed and PUT THEM IN THE TRASH. This vigorous sanitation is a good idea for all pests too. If you had bean beetles…get rid of those leaves that might have next year’s eggs. But don’t be too clean. That’s the important lesson here. In the non-diseased parts of the garden, ladybugs and lacewings and lots of beneficial insects are going to lay eggs and overwinter. We want them. I learned last year especially to let willow leaves be…there were dozens of beneficial babies at the base of willow plants last spring. And next year…be attentive to the powdery mildew. I now promise to treat early and often with something gentle but effective such as horticultural oil or a baking soda. I lost a lot of production in my vegetables this year because I let the powdery mildew have its way. And the roses and phlox really took a hit. I’ll do better next year. I promise.